Feature rich all black Ninja warrior sword with back sheath. This full tang sword measures 27" overall and offers stainless steel construction with a black finish and tanto blade style. The handle is tightly wrapped with nylon cord and offers a ring pommel with attached lanyard. The black nylon sheath includes Velcro closures. Designed for fast access from the back strap to your hand. I purchased these bad boys on a bogo + free shipping deal and I could not be happier. The shipping got here at a very respectable speed for it being free for one. Theyre tough and lightweight, and go great with Adult Ninja Costumes. I wouldn't recommend this for your child if you're pondering the idea. Unless your child is a badass and can use a sword properly and safely. But overall it was the best $13 I've ever spent, and I highly recommend it for swordsman who are shorter. Bought this for my son as a first sword cus of the price and he loves it and I LOVE IT. I had to try it out first and I'm impressed. Not real sharp but cuts. I'm going to leave the way it is for him but now I'm going to buy one for me and give it a good sharpening. Sheath is great but shoulder strap little small for big boys to wear like a ninja:) excellent to use as a machete. Thick blade. Wish strap was longer but includes belt strap and the little wrapping on blade above handle is cheesy but can put leather boot lace if want or just take off. This was delivered to me just yesterday and it's more beautiful than looking at it on the site. It arrived earlier than expected but that makes it even better. After seeing the demo video on this sword my brother and I bought two, 0ne for my brother and one for me. This sword is great for camping and survival,and might I add an excellent weapon for fighting zombies. I bought one of these swords & I liked it so much, I bought a 2nd one, so I could wear them criss-cross on my back. These are amazing for the price! Very sharp right out of the box. 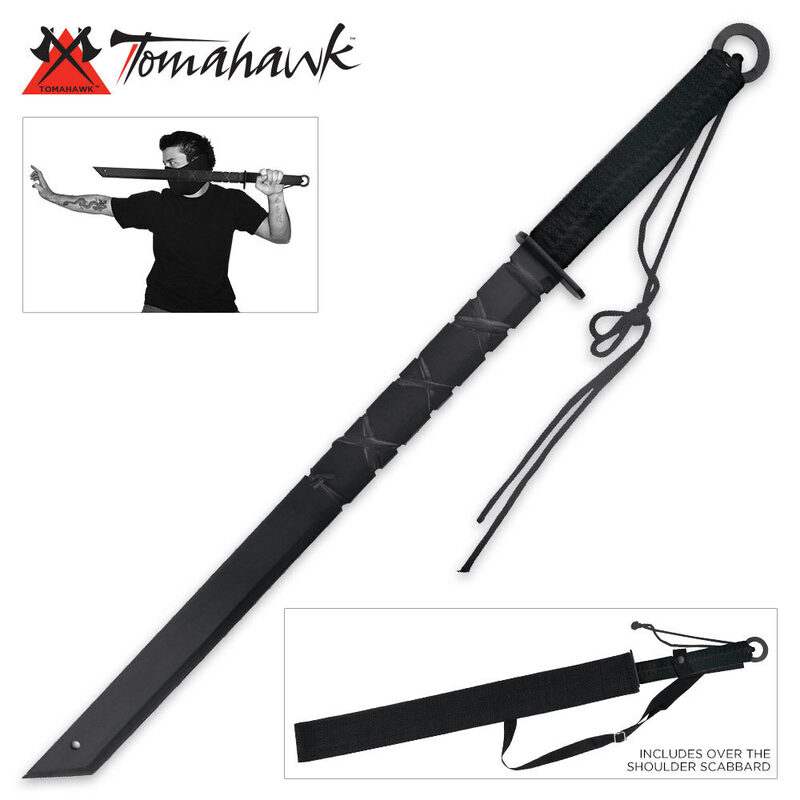 I was looking for some cheap but reliable 1-handed tanto short swords for my stealth ninja get-up & these are perfect. As is typical with cheaper weapons, the sheaths leave a bit to be desired, but after doing some modification & fortifying them, it wasn't a major problem. I like the cord wrap on the blade, but I replaced it with my own paracord. The little cut-outs in the blade are cool, but make it a little difficult to pull the sword out of the sheath; they tend to snag & chew up the sheath somewhat. The ring pommel is cool because you can use them in conjunction with chains. For the price there's nothing to complain about! Received the sword in a packaged box barely still intact. Upon opening it, I found the sword right on top of the packing material when it should've been packed in-between, surprising me how it even made the trip here. Upon unsheathing the blade, I found a few scratches already on it, as well as a lot of spots too. The leather wrapping around the blade and the cord wrapping on the handle was tied pretty loosely, but after re-wrapping them, it started to feel more like a good sword. The sheath isn't much to talk about obviously, but for $10, the sword is well worth it. I got this as a bogo item, and my total was $21, I sold one to my friend for $10. So for a $10 sword this goes far above my expectations. I've smashed some trees with it, and I only have 1 scratch of cosmetic damage. So it's decently durable, and it came decently sharp too. This is very much so worth your money. The video sold me on this sword and we were able to do everything in the video right out of the box. The Gallagher-esque romp was worth every penny and left many a dead fruit and soda.